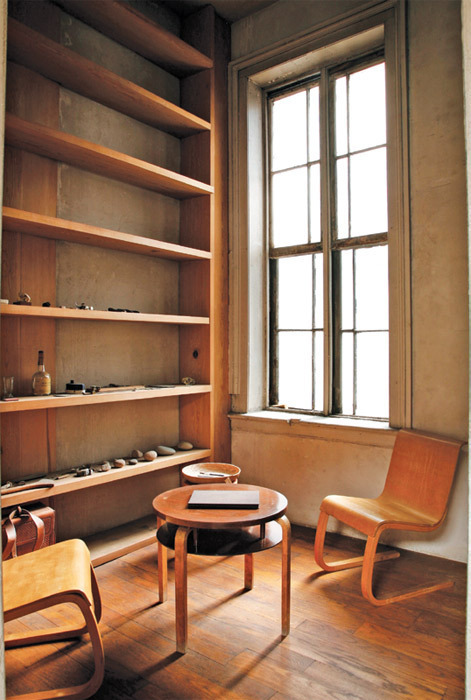 Donald Judd’s library prior to restoration, third floor, 101 Spring Street, New York, 2010. Photo: Mauricio Alejo. © Judd Foundation. THE RESTORATION PROJECT was like a puzzle: How could we update 101 Spring Street for safe public occupancy while keeping it the way Don had wanted? Since I grew up in the building, I could refer to conversations I had with my father about different parts of the building, or at least about similar circumstances. When we didn’t have a historical precedent for solving a particular problem, we simply had to do the best we could. Fortunately, Rob Beyer, who was the other Judd Foundation board member leading the project, helped pick a great team, which included Guy Nordenson on the foundation’s Building Committee, Architecture Research Office as project architects, Walter B. Melvin Architects as preservation specialists, Robert Silman Associates as structural engineers, and Arup as fire-safety consultants.